So far in my family history research I have not used DNA testing. Document-based methods give me more than enough to go on with. Henry Sullivan (1862-1943), a great grandfather of my husband, was admitted as a state ward in Geelong in 1866 about the age of four. His parents had deserted him. George Young (1826-1890), from Liverpool, a great great grandfather of my husband, provided no information about his parents. Caroline Clarke (1835-1879), wife of George Young and a great great grandmother of my husband, was not specific about her birth and I have been unable to trace her parents, perhaps John Clark(e) and Hannah Sline. She said she was born about 1835 in Tumut. But she also said she was born in Sydney. I’ve got nowhere with this. Having ordered the kits I thought I might look again at these brick walls. More newspapers and other records have been digitised since I last looked. I thought there might be more material. I didn’t get any further with the Young and Clark puzzles. However, I think I have made some progress with Henry Sullivan. The story I have found seems plausible, and more information may turn up, but a DNA link would be very useful to confirm my guesses. 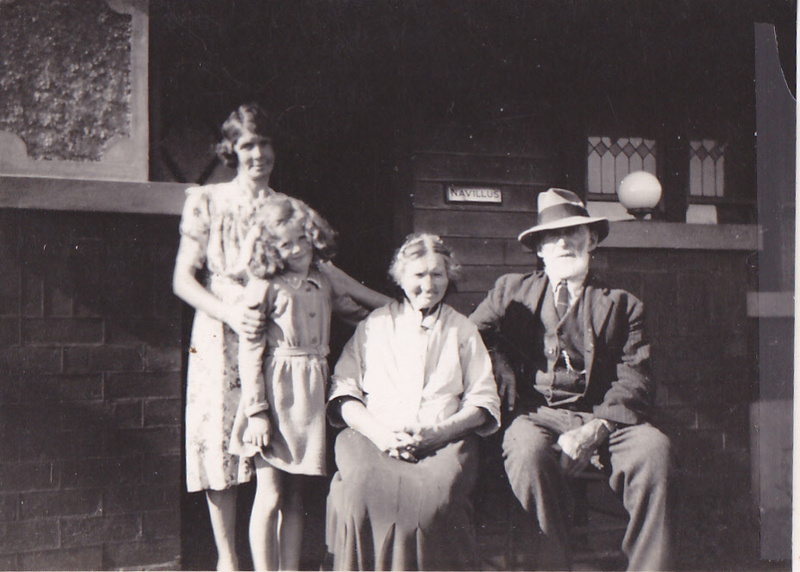 Henry Sullivan at his house, “Navillus”, in Bentleigh, Victoria with his wife Anne Sullivan née Morley (1861-1946) and daughter-in-law Florence Sullivan née Hickson (1898-1983) and grandaughter Elaine Sullivan later Priest (1933-1987). Photo from Elaine’s daughter. Henry Sullivan (1862 – 1943) was committed as a State Ward in Geelong on 11 June 1866 for seven years. He was said to be a native of Victoria. He was a neglected child. At the time of his committal, both his parents were said to be living but he had been deserted. His parents’ names were not given on the Ward Register. He had lost the sight of his right eye. Family stories say he was struck by a magpie. We have not been able to find a birth certificate. Sullivan Henry VPRS 4527 OS 1 no 1768. In 1873, when the first seven year committal period expired, Henry, aged 11, was recommitted. At the time of his recommittal it was again stated that both parents were living and that they had deserted him in June 1866. I had earlier looked, without success, for records of court cases in Geelong in June 1866 to find reports of Henry Sullivan being committed as a State Ward. Today I reviewed newspaper reports from May 1866. I think that small child was Henry Sullivan. Fourteen days after Mary’s appearance in court on 25 May was about the 8th of June. I suspect that when Mary Sullivan was released from gaol she decided she could not cope with an extra child not her own. On the 15th May 1866 there had been another report of a child and a young woman called Sullivan. I think in the court case this child is the ‘little one’ and the woman Sullivan is the Mary Sullivan who, less than two weeks later, was found guilty of stealing. There were two clues to follow up. The step-father of the mother was surnamed Hughes and the mother of the child was the parent of the infant upon whom an inquest was held at Ashby some time previously. I had some trouble finding the inquest. I dashed down to the library to look at the index of inquests. The surname Sullivan produced nothing likely and inquests held at Ashby also didn’t seem to produce anything. I returned to searching the newspapers. Deaths of infants and consequent inquests were unfortunately quite common. I found an inquest in November 1865 where the grandmother was Mrs Hughes. I believe this is the inquest to which the Geelong Advertiser of 15 May 1866 referrs. Margaret Maria Sullivan aged six months starved to death. She was in the care of her grandmother Matilda Priscilla Hughes, the wife of David Hughes. The parents were William Sullivan and Matilda Frances Sullivan. The Geelong Advertiser of 23 November 1865 reported the surnames as Sutherland but the Mount Alexander Mail of 24 November 1865 gave the surname as Sullivan. 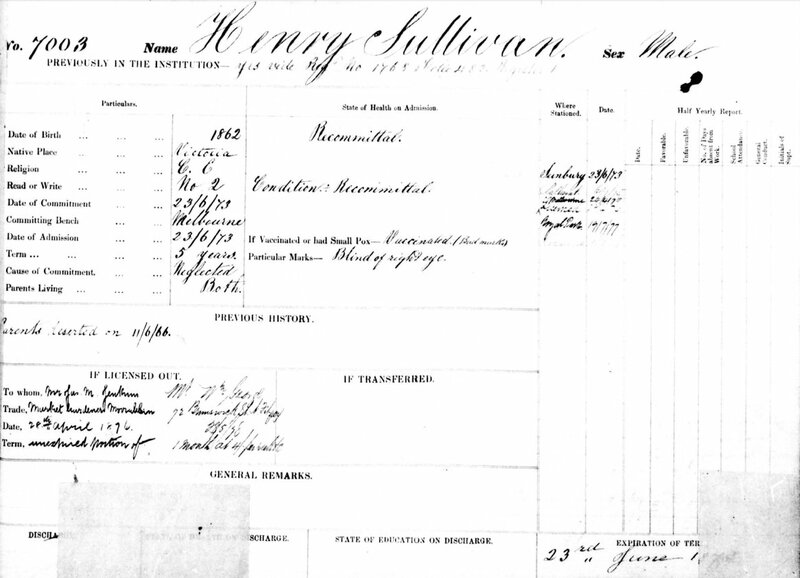 The birth and death indexes confirm that the surname was indeed Sullivan. The jury returned a verdict of manslaughter against the grandmother, and also against the mother as an accessory to the child’s death. The Victorian birth, marriage and death indexes confirm the evidence given at the inquest. birth Eleazar Hughes, no father, mother Matilda Hughes. Registration 1861 / 8434 born CHERHAP (this is probably Gheringhap, a Geelong street name but also a village at the junction of the Geelong-Ballarat (1858-62) and Geelong-Maroona (1913) (to Ararat) railways. There were large numbers of navvies and associated construction workers in the area during both those periods.). marriage 1862 William Sullivan and Matilda Frances Hughes. Registration 1862 / 4376.
birth Margaret Maria Sullivan, father William, mother Matilda (Hughes). Registration 1865 / 8809 born ASHB, probably Ashby, a locality in Geelong West. death Margaret Maria Sullivan, father William, mother Matilda Frances (Hughes). Registration 1865 / 8836. Place of death ASHB. There seems to be no other record of Ebenezer Henry Sullivan in the Victorian Birth, Death and Marriage indexes..
Eleazar / Eleazer Hughes married in 1881, had children and died in 1949. There are a number of family trees on Ancestry.com which include him. 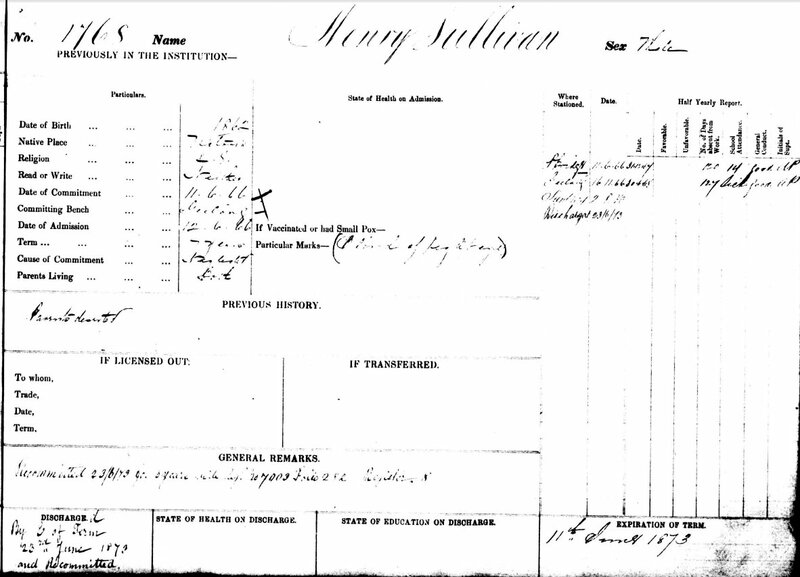 I believe, based on the coincidence of the court reports and the committal of the small child as a State Ward in 1866, that my husband’s great grandfather Henry Sullivan, was Ebenezer Henry Sullivan, the son of William Sullivan and Matilda Frances Hughes. Should any descendants of Eleazer, Henry’s half-brother, be willing to help, DNA testing might be able to confirm this.